Cycling to work and suits don’t really go that well together, unless of course you’re wearing a Commuter Suit. 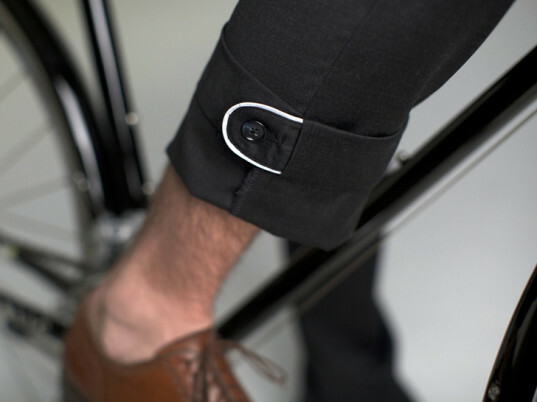 Designed by San Fran-based Parker Dusseau, the Commuter Suit combines the best of your lycra with your business suit. Flexible, anti-microbial wool, crotch gussets, secret underarm zipper vents and discrete reflective tape under the collar make it perfect to bike in, but the fabric, cut and style make the suit perfect to look good at work. Many bike commuters are content with wearing active wear on their way to work, then changing once they get there. That’s fine if all you do is go to work and stay there, but what if you have meetings during the day and you want to go by bike. You’re not gonna keep changing clothes are you? Enter Parker Dusseau’s Commuter Suit – the perfect blend of cycle gear and men’s fashion. The suit is cut from a blend of Australian 135 Performance Superwool and spandex, which allows for a high quality look while adding a bit of stretch and some anti-stink capabilities. A special poly tricot mesh and spandex liner helps pull moisture away and you to stay cool while biking. The style allows for movement, stretching and exertion with a pleat in the back of the jacket. Hidden reverse coil zippers under the arm can be opened for ventilation and the pants feature a gripper waist band that helps your shirt stay tucked in even while pumping up a big hill. To keep your pants from getting caught in your gears, there’s a reflective and elastic cuff that keeps the right pant leg tight. Finally, if you’re riding at night, you might want to pop your collar, not because it’s a cool thing to do, but because there’s a stripe of reflective trim so you can be seen by cars. The pants pocket and sleeves also feature hidden trip that you can turn out. Suits come in Charcoal and Navy along with special Commuter Dress Shirts in White and Periwinkle. Prices run at $730 for suits and $145 for shirts (available on Parker Dusseau), which may seem pricey, but not if it’s your favorite suit that you can bike to work in. Cycling to work and suits don't really go that well together, unless of course you're wearing a Commuter Suit. 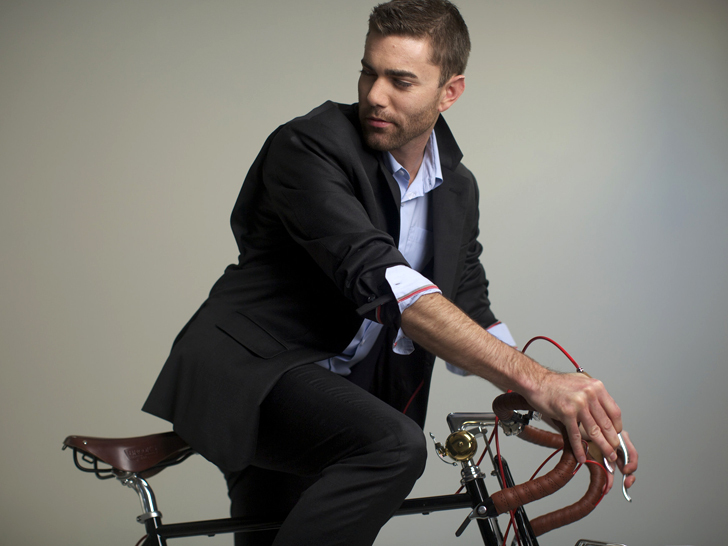 Designed by San Fran-based Parker Dusseau, the Commuter Suit combines the best of your lycra with your business suit. Flexible, anti-microbial wool, crotch gussets, secret underarm zipper vents and discrete reflective tape under the collar make it perfect to bike in, but the fabric, cut and style make the suit perfect to look good at work.